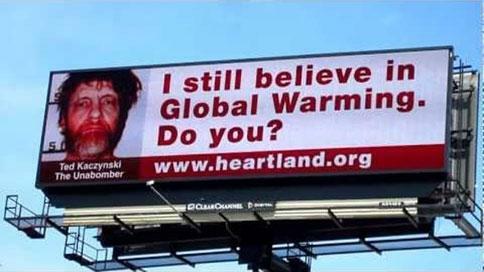 A billboard suggesting that those who believe in global warming are as crazy as the Unabomber was taken down less than 24 hours after it went up--but not before the group behind the ad lost another prominent backer. A quote, attributed to Ted Kaczynski, was displayed on the electronic billboard: "I still believe in global warming. Do you?" The sign--the first in a campaign that was supposed to include Osama bin Laden, Fidel Castro and Charles Manson--went up on Thursday along a highway outside Chicago. It was removed on Friday. But the Heartland Institute, the conservative think tank that created the billboard, was unapologetic: "This provocative billboard was always intended to be an experiment," the group said in a statement. "And after just 24 hours the results are in: It got people's attention. This billboard was deliberately provocative, an attempt to turn the tables on the climate alarmists by using their own tactics but with the opposite message." The ad was, in part, a stunt to get attention for Heartland's conference for climate change skeptics, slated for May 21-23 in Chicago. According to the Chicago Tribune, Rep. Jim Sensenbrenner (R-Wis.) threatened to cancel his speech at the conference if Heartland didn't pull the ad. "We know that our billboard angered and disappointed many of Heartland's friends and supporters, but we hope they understand what we were trying to do with this experiment," Heartland president Joseph Bast said in a statement. "We do not apologize for running the ad, and we will continue to experiment with ways to communicate the 'realist' message on the climate." Diageo, the London-based beverage importer, said it would no longer support the institute. "Diageo vigorously opposes climate skepticism and our actions are proof of this," a spokeswoman for the company told the Guardian. "Diageo's only association with the Heartland Institute was limited to a small contribution made two years ago specifically related to an excise tax issue. Diageo has no plans to work with the Heartland Institute in the future." In March, General Motors announced it was pulling funding for Heartland over the group's stance on climate change.